Got a problem running vSphere Client today? Seeing the following pop-up when trying to access your VMware stack? Your environment has not been hacked! It’s a problem with your most recent Windows Update, introducing a .NET exception that your “old” version of VMware vSphere Client can’t handle. While you can uninstall the offending patch(es) to resolve the problem, the best remedy is to login to VMware’s site and download the latest vSphere Client (VMware KB 1022611). By the way, if you’re vSphere Client is old enough to be affected (prior to Update 1), you might need to scan your vSphere environment for updates too. If you have SnS, run over to VMware’s download page for vSphere and get the updated packages, starting with the vSphere Client: you can find the installable Client package with the vCenter Server Update 2 downloads. Two patches were made available on May 27, 2010 for ESXi 4.0 to fix certain bugs and security vulnerabilities in the platform. These patches are identified as ESXi400-201005401-SG and ESXi400-201005402-BG. This patch fixes a security issue. The updated NTP daemon fixes a flaw in the way it handled certain malformed NTP packets. The NTP daemon logged information about all such packets and replied with a NTP packet that was treated as malformed when received by another ntpd. A remote attacker could use this flaw to create an NTP packet reply loop between two ntpd servers through a malformed packet with a spoofed source IP address and port, causing ntpd on those servers to use excessive amounts of CPU time and fill disk space with log messages. The Common Vulnerabilities and Exposures Project (cve.mitre.org) has assigned the name CVE-2009-3563 to this issue. Network pings to the ESXi hosts might fail. Baseboard management controllers (BMC) such as HP Integrated Lights-Out (iLO) console might appear to be in a non-responsive state. The VMware Snapshot Provider service is not listed in the Services panel. The quiesced snapshots do not use VMware Tools VSS components in Windows Server 2008 R2 or Windows 7 operating systems. This issue is seen when the user or backup software performs a quiesced snapshot on virtual machines on ESXi 4.0 hosts. This patch fixes the issue. Since VSS quiescence is at issue here, DR snapshots and backups relying on VMware Data Recovery may be unreliable without the new VMware Tools installed. If your systems rely on VMware Data Recovery APIs for backup, this patch should be considered mandatory. Until there is an updated release of the VMware vSphere Client, running the client on a Windows7 system will require a couple of tricks. While the basic process outlined in these notes accomplishes the task well, the use of additional “helper” batch files is not necessary. By adding the path to the “System.dll” library to your user’s environment, the application can be launched from the standard icon without further modification. Once the changes are made, save the “VpxClient.exe.config” file (if your workstation is secured, you may need “Administrator” privileges to save the file.) Next, copy the “System.dll” file from the “%WINDOWS%\Microsoft.NET\Framework\v2.0.50727” folder on an XP/Vista machine to a newly created “lib” folder in the VpxClient’s directory. Now, you will need to update the user environment to reflect the path to “System.dll” to complete the “developer” hack. To do this, right-click on the “Computer” menu item on the “Start Menu” and select “Properties.” In the “Control Panel Home” section, click on “Advanced system settings” to open the “System Properties” control panel. Now, click on the “Environment Variables…” button to open the Environment Variables control panel. If “DEVPATH” is already defined, simply add a semi-colon (“;”) to the existing path and add the path to your copied “System.dll” file (not including “System.dll”) to the existing path. If it does not exist, create a new variable called “DEVPATH” and enter the path string in the “Variable Value” field. The path begins with either %ProgramFiles% or %ProgramFiles(x86)% depending on whether or not 32-bit or 64-bit Windows7 is installed, respectively. Once the path is entered into the environment and the “System.dll” file is in place, the vSphere Client will launch and run without additional modification. 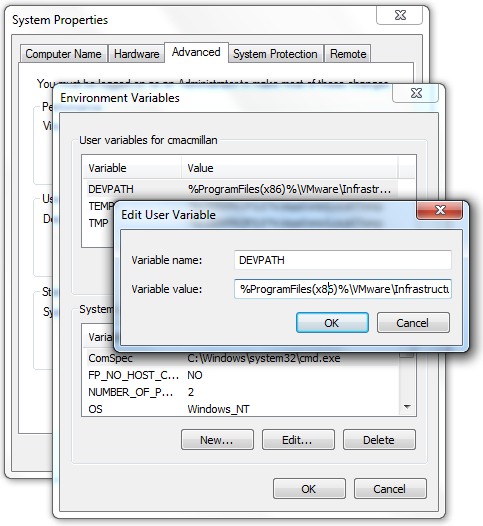 Remember to remove the DEVPATH modification to the environment when a Windows7 vSphere Client is released.